Numerous technology innovations has transformed parking from manually operated to being wirelessly and remotely managed. Smart parking bay sensors brings innovation to the table by detecting space occupancy and wirelessly communicating information to cloud data centre, thereby processing the sensor data to provide the availability of parking spaces through a smart phone app, in-car app or using display boards. Sensors come equipped with multiple forms of technology – infrared, magnetic and ultrasonic based on the location and usage. 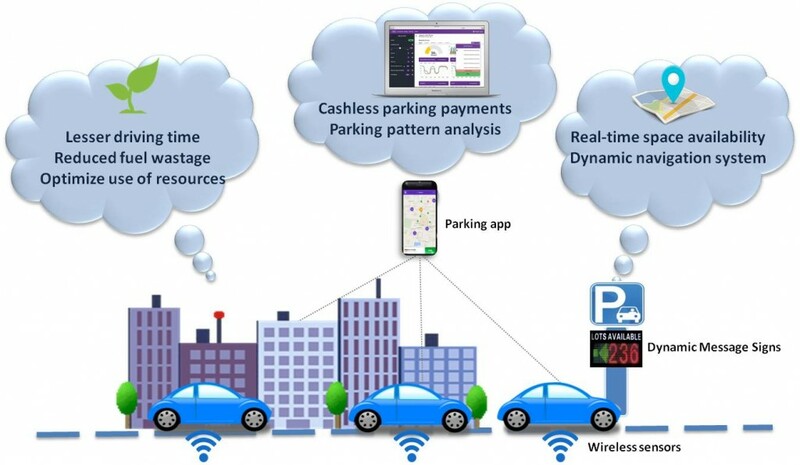 The end-to-end system has been able to substitute ticket printers, hand-held devices, parking meters to enable parking more seamless, connected and convenient. It even finds its usefulness in supporting legacy systems used in parking and checks on pilferage as well as administer on-street parking enforcement. Smart sensors in parking bays drive occupancy and increase effective use parking space (and maximise income). Globally, smart cities are using bay sensors for real-time detection and availability of parking spaces. The use of sensors has also helped cities and parking authorities to monitor and accurately utilize each space. It is estimated, smart parking on an average, contributes nearly 2% of a smart city’s revenue and is expected to grow to 10% by 2025. For example, Barcelona city has increased parking-fee revenues by $50 million annually, utilizing smart parking technology. They are highly effective for on-street parking scenarios, private parking lots, hospitals, university campuses, airports, stadiums and events. Additionally, parking sensors are cost-effective, accurate, and scalable for wide-ranging infrastructure and has minimal expenditures on installation and maintenance. PParkE (www.pparke.in) emphasizes on sensor based parking automation using a SaaS solution. It allows parking deployment at both private parking lot and street parking, enable booking of spaces, and payment through app (pre-booking and post parking payment) backed by advanced analytics. PParkE – A viable solution for cities to make them smart.